(IDEX Online News) – The Belgian authorities have announced a breakthrough in the investigation into a so-called tiger kidnapping that occurred in the city on October 11, 2012 - and it turns out that it may not have been quite what it seemed with the investigation seeming to indicate that the crime was staged by the alleged victim. During the incident, three men entered the home of an employee of the Indian diamond company Kiran BVBA. 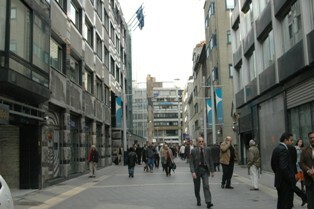 While the man's wife was kept hostage, the employee was forced to empty the vaults of the Kiran offices in the Hoveniersstraat in the Antwerp diamond district. The total value of the stolen diamonds was estimated at $13 million. Between July 22 and 29, five people were arrested in connection with their alleged involvement in the case. These include the prime suspect – a 27-year-old employee at Kiran BVBA, a 29-year-old middle-man of Indian origin, a 48-year-old Armenian who was hired to execute the kidnapping and two Chechens aged 30 and 43 who were hired by the Armenian accomplice. Four of the suspects remain in custody and are said to have confessed to their involvement in the case. The alleged middle-man was arrested at Schiphol airport in Amsterdam on July 30 and procedures to extradite the man to Belgium are currently ongoing. Most of the stolen goods, estimated at $8.5 million, were recovered during a raid in Antwerp on July 31. “We cannot comment on individual cases, but from a general perspective, we are very pleased with the progress that is made in the investigation. As the representative organization of the Antwerp diamond community we invest heavily in the security levels of the Antwerp diamond industry and we will continue to do so in the future,” said the Antwerp World Diamond Center (AWDC) in an official statement on the situation. “The AWDC Security Office anti-tiger kidnapping program, tailor made for the Antwerp diamond companies, is a perfect example of that approach. A tiger kidnapping still remains an exception. In the past three years, only two tiger kidnappings took place in Antwerp, including this case. The efforts towards security, prevention and the intensified collaboration with other authorities clearly pay off. A tiger kidnapping, or tiger robbery, involves two separate crimes. The first crime usually involves an abduction of a person. Instead of demanding money, the captors demand that a second crime be committed on their behalf, such as a theft. The person held hostage is kept by the captors until their demands are met.